Frozen cherries can be substituted for fresh cherries in most recipes. If you are substituting canned cherries for fresh, you may need to drain or rinse off the syrup before proceeding. Dried cherries, usually made from sour cherries, are called for in recipes for cookies, savory, cold weather meaty dishes, and fall and winter salads. Knowing when to use the different kinds of cherries and how much you will need are key to getting the right cherries and the right amount for your cherry recipes. Most recipes call for sweet cherries, but if you get lucky and can get your hand on fresh sour cherries, you can make a sour cherry pie, tart, preserves, or relishes that are divine. The bright red Early Richmond variety of sour cherries are available in late spring followed by the Montmorency and the dark red Morello varieties. Sour cherries are normally cooked with sugar and used for pies, preserves, and relishes. Most heart-shaped sweet cherries are available from May through August. 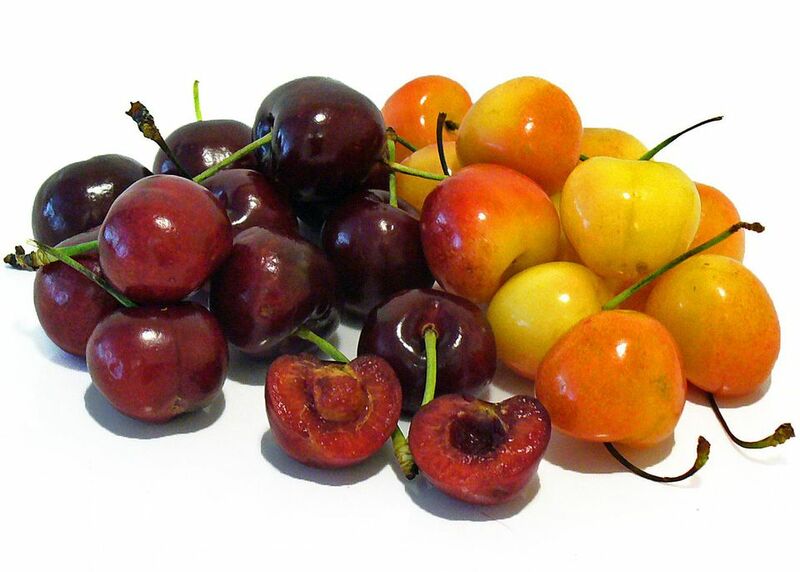 Sweet cherries are larger than sour cherries. They range in color from golden red-blushed Royal Ann to dark red to purplish-black Bing, Lambert, and Tartarian varieties. One serving of cherries per person is about one cup or 20 cherries. For dried cherries, a one-person serving is half a cup. Recipes usually call for more than one serving, for example, if you are making a pie. Fresh cherries should be clean, bright, shiny, and plump with no blemishes. Avoid cherries with cuts, bruises, or stale, dry stems. You can buy cherries with stems removed, which are less expensive, but if the stems are intact, the cherries will have a longer shelf life. Sweet cherries should have firm, but not hard flesh, while sour cherries should be medium-firm. The darker the color, the sweeter the cherry. Unopened, dried cherries last the longest, up to 18 months. Unopened canned cherries have a shelf life of about one year. Once you open a can of cherries, they will keep in the refrigerator in a covered container for about one week. Jarred Maraschino cherries can last six to 12 months in the refrigerator. Fresh cherries can keep a little longer in a bag in the refrigerator but have the shortest staying power than the other ways of storing cherries. Raw sweet cherries are mostly water (82 percent), 16 percent carbohydrates, 1 percent protein, with a hardly traceable amount of fat. One cup of cherries is less than 90 calories and has 3 grams of fiber. Diets high in fiber have been found to aid in digestion, can help lower cholesterol, control blood sugar, and can help with weight loss. Cherries are a good source of vitamin C with 16 percent of the daily recommended value in one cup. If cherries are one of your favorite fruits, then you might want to check out one of these cookbooks that feature sweet and sour cherry recipes.